Our bowling season runs from around mid-April through to mid-September, and during this time our bowlers participate in a wide range of bowls matches. Once the season gets into full swing there are bowls matches of one sort or another almost every day. are played throughout the season, normally in triples format and are usually held on weekend afternoons. However, there are occasional Friday evening match on offer too. For beginners, these games provide the first taste of team bowling, playing alongside more experienced bowlers within the club in a more social than competitive environment . Our location in the north east corner of Wiltshire means that, as well as playing other Wiltshire clubs, we regularly play clubs from the neighbouring counties of Berkshire, Oxfordshire and Gloucestershire. Highworth’s ladies’ teams compete in Swindon & District Rinks & Triples leagues. Triples matches take place in the afternoons, whilst Rinks are played in the evenings. One match of each will usually takes place each week, but days on which each is played varies but the two are scheduled not to be played on the same day of the week. 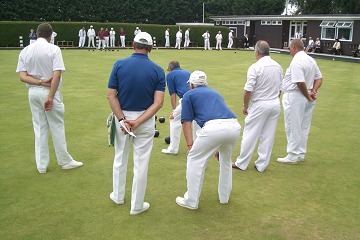 Highworth’s men’s teams compete in Swindon & District Bowls Associations’ and Bowls Wiltshire leagues and competitions. Bowls Wiltshire league matches are usually played on Wednesday evenings with the aim being to finish in a high enough position to qualify for the knockout competition that takes place once the league rounds are completed. Swindon & District matches take place om Thursdays with a second match occasionally taking place on Tuesdays. There are also men’s team participating n the Monday afternoon Triples league. Highworth bowlers compete against each other for club honours in both club knockout and internal league competitions, The knockout competitions are played throughout the season and culminate in our finals weekend early September. There are competitions in singles, pairs, and triples formats for both ladies and men; mixed singles and mixed pairs competitions; as well as a singles competition restricted to bowlers who have not previously won a club singles competition. Trophies are awarded at our annual presentation dinner, held at the club, after the close of the season. Established bowlers will probably also seek to compete in one or more Swindon & District, Wiltshire County or National competitions. Again offering singles, pairs, triples and rinks matches, these games provide the bowler with the opportunity to play competitive bowls against other teams or individuals from the local area, perhaps progressing to play against winners from other counties, with the ultimate aim of reaching the national finals at Leamington..
Our green is regularly selected to host both ladies’ and men’s representative matches. The club also welcomes the visit of bowls tour parties. In addition, we normally hold some special club matches during the season, at which all our bowlers have an opportunity to get together for fun or for a good cause. One such match is our annual President’s Select vs. Captains’ Select match where club members are pitted against each other in a variety of short matches with novel twists. Other special matches include fund-raising games and invitational gala days. As if this weren’t enough, you’ll often find our bowlers on the green in spare moments, playing informal games or just practicing (we call it ‘rolling up’) – we always try to keep at least one rink free for roll-ups. New bowlers are encouraged to receive free coaching sessions from the club’s qualified bowls coaches. 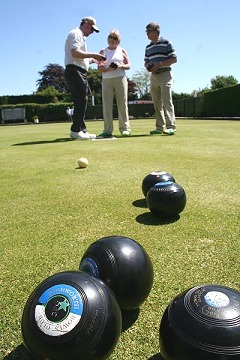 Club bowls and equipment can be used until the new bowler decides to buy his/her own equipment.